This is one my all time favourite chutney. My grand-mom would never use a blender / mixer to make chutney. She would grind her chutney using a grinding stone and it would give the chutney an extra special taste. 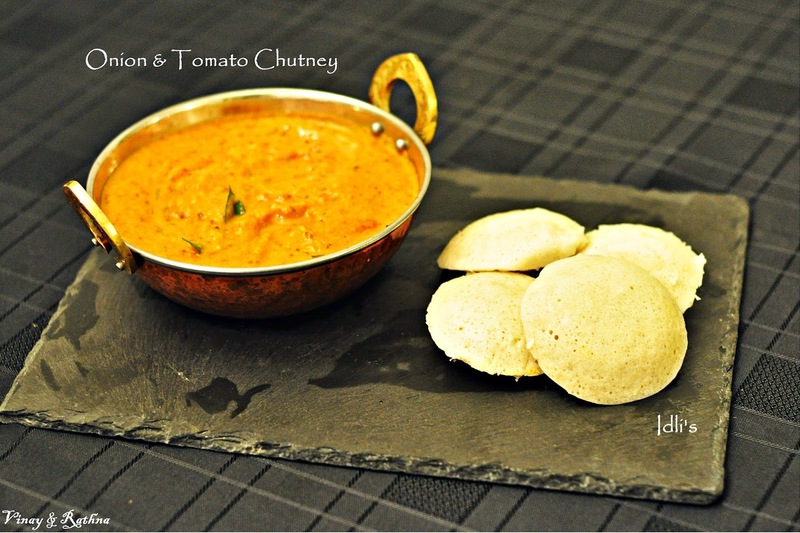 The tomato and onion chutney was one of her classics that she would serve with hot soft Idli's or with crispy thin paper roast dosa's for breakfast. Longing for breakfast's like this everyday. Heat oil in a pan and add mustard seeds and cumin seeds. When they begin to pop, add in fenugreek seeds, cumin seeds, fennel seeds, mustard seeds, urad dal, red chill and curry leaves. Cook for a few seconds. Add in the garlic and onion and sauté these till the onion turns translucent. Now add the chopped tomatoes and let it cook till the tomatoes become soft. Switch off the stove and let the mixture cool. Once the mixture cools down, blend it with sambar powder and water into smooth chutney. Heat oil in the pan and add all the ingredients for tempering. Once the mustard seeds pop, lower the flame and add the blended chutney into the pan. Slow cook for around 5 minutes. Serve the chutney with Idli or Dosa. It also tastes great with any type of bread. Garlic is an optional ingredient. Reduce Red chilli or avoid it based on how spicy your Sambar powder is. This recipe tastes even better if made with small red onions instead of the regular onions.